LG the Korean Giant electronics Company has its flagship Smartphone under ‘G’ series and the latest LG G4 was released in 51.5K INR in initial days (April 2015) now which comes down to 33.5K INR (Nov 15). This handset featuring Snapdragon 808 Hexa-core processor, 5.5 inches display, 16 & 8 MP cameras, 32 GB ROM with 2 TB Ext. SD card support and 3000 mAh battery. 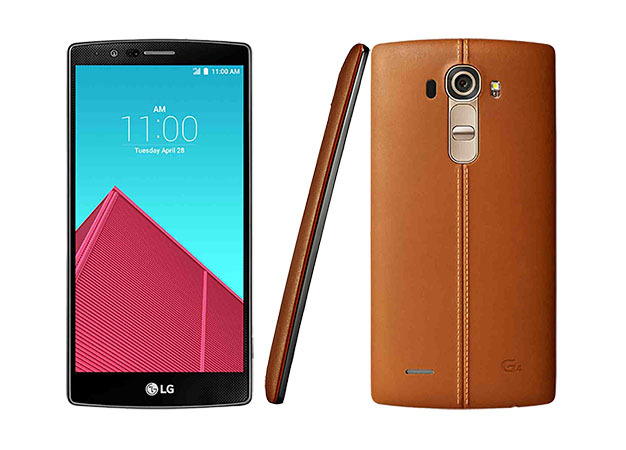 Here we will have Short review, Pros and Cons of LG G4. The corners of the handset are sharper instead of smooth like galaxy phone. The back is smartly designed in a way that raised at the centre and the thickness reduces towards the side edge, this slim arc design helps in firm grip and just below the primary camera power buttons and volume rockers are fixed. There is no button located in the side edge and bottom is house of USB port and 3.5mm headphone jack. Handset comes up with different variant of the back viz. leathery, Ceramic and metallic that you can choose according to your preference. The display is improved from its predecessor LG G3. The screen has resolution of 1440x2560 pixels and the 538ppi display density. The qHD obviously delivers sharp viewing experience but it is power consuming may have load over the battery. You didn’t face any problem regards readability in sunlight; display also has wide viewing angle finally we can conclude about the screen is awesome not going to disappoint you anyway. When it comes to performance we are really happy with such a lag free experience from a handset having Qualcomm MSM8992 Snapdragon 808 Hexa-core processor with 1.8 GHz of clock speed. This handset is a good multi-tasker even after loading many apps in phone the performance remains smooth. UI of the LG is simple, efficient and easy to use; it does not have unnecessary bloatwares that also improve Smartphone performance. Handset featuring 16 MP stunning primary camera with 1.8 f aperture and colour spectrum sensor that is able to capture a quality photograph with deep details and accurate colour. To reduce the blur effect of photos due to shaking there is Optical Image Stabilization 2.0 that can do a good job to capture moving objects. Same things applied for the 8MP front facing camera that do not disappoint any Selfie enthusiastic person. For the supply of power it has 3000 mAh battery that is only thing in this handset where it can make disappointed a bit, although 3k mAh battery is not less but features of the handset such as qHD display, 4K recording etc makes load on power. Still it gives average battery backup. Phone has LED light Notification. Screen is protected with Corning Gorilla Glass. Other support NFC, FM radio. Battery backup is not up to expectation. The handset is not water resistant. Phone does not have fingerprint sensor. Does not have latest marshmallow OS version. The LG G series is quite popular for the great quality features. Now we definitely recommend this handset for camera enthusiastic people. Other features like performance, sound quality is pretty good in this handset it also has a great premium design. Apart from the average battery backup everything is impressive and worthy.